A couple of years ago, our lovely younger daughter arrived on our doorstep with a plastic bag of fabrics. 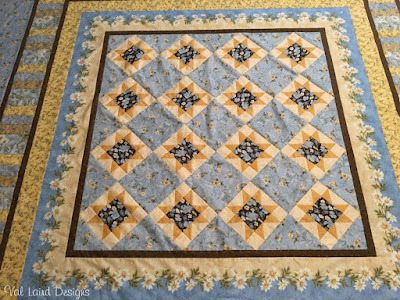 There were a couple of pretty blue and yellow yardages, lots of medium-value, medium-scale smaller pieces and a lovely border print. 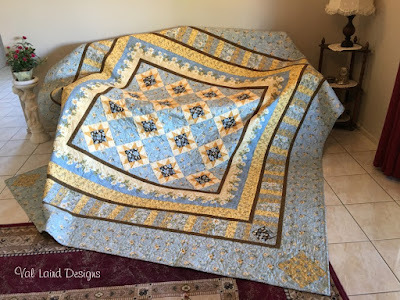 It all came with the request to design and make a King Size quilt for her! That bag sat in my sewing room for some months while I tried to figure out how I could design something suitable with all those bits and pieces. The lovely border print had to be the foundation. It wasn't a huge piece so I worked out the maximum size I could get out of it with mitred corners, and then fitted everything else around it. 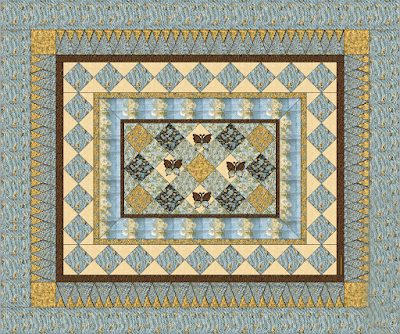 Above is the rough digital mock-up of what I thought would work (ignore the butterflies which shouldn't be there). Daughter was fairly happy with it, but husband didn't like it at all! Seeing it was for their own bed, they both needed to like it! Needless to say, the bag of fabrics went right to the back of my sewing cupboard, hidden away where I couldn't see it! Last year, two years later, I was looking for something to stitch. 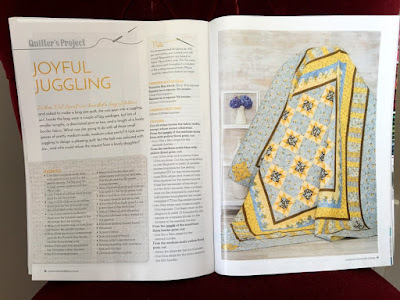 There was by now only a limited market in magazines for the smaller projects I liked to design, so I was thinking it was time to make another quilt. It was then I remembered that bag of fabrics! But I also remembered the dilemma of trying to please both parties! 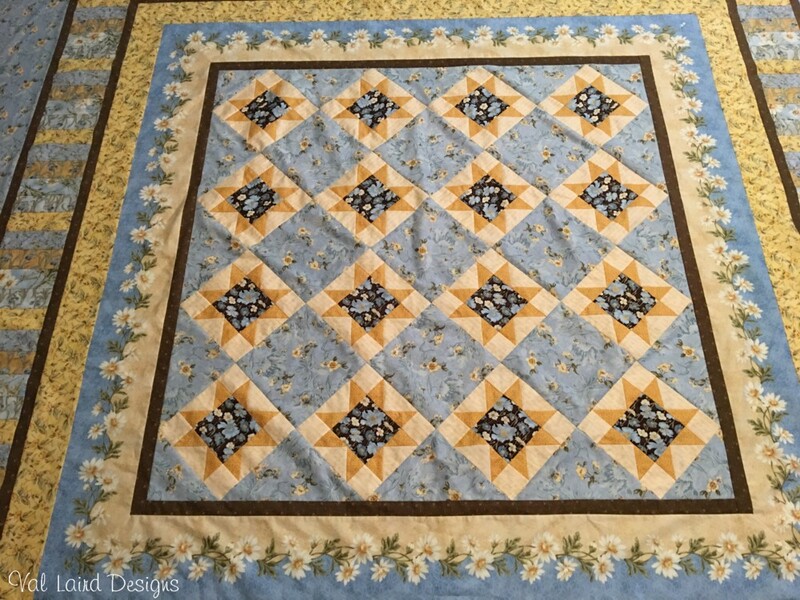 I made an executive decision that I would design the quilt, add some of my own fabric to it to give more possibilities, make it, and pay to have it professionally quilted. Seeing I was supplying extra fabric, backing fabric, batting and the quilting, I figured it was going to be a good Christmas present for our daughter! If she didn't like it, then I would pay her for the fabrics she had given me and use it in our own home. Then began the juggling act! Thankfully with my EQ7 software programme, it was easy to see what would work and fit and whether I would have enough of any one fabric. 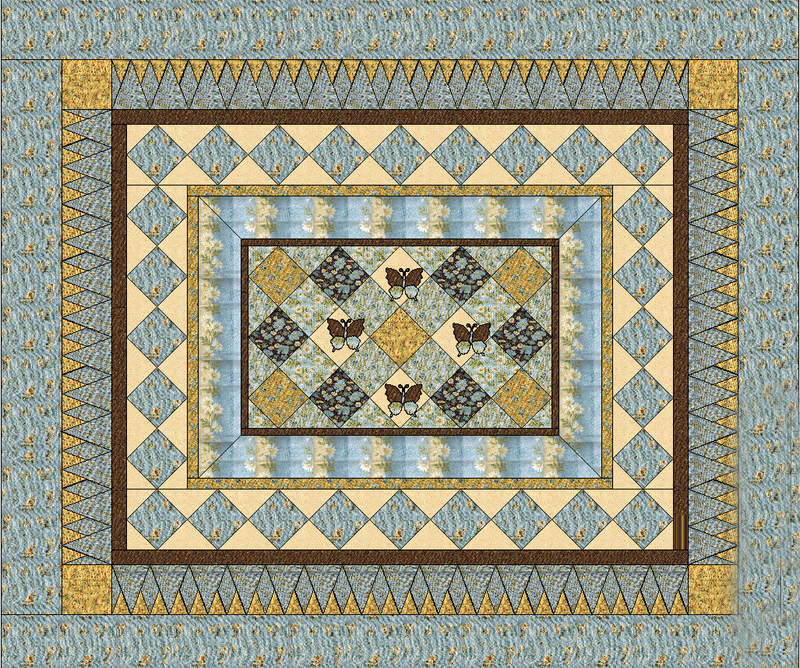 Lots of designs later, I came up with this centre design to fit in the pretty daisy border fabric. But whatever was I to do with all those medium-value, medium-scale prints? It took a while, but eventually I thought of a piano key border. Set between the brown strips, it is a nice wide border, without detracting from the feature centre. I had JUST enough fabric to add a final border to make the 100 inch square quilt and enough bits and pieces to make two matching pillow cases. Christmas Day arrived and I was half hoping that daughter didn't like the quilt so that I could keep it for our spare room! It was probably only about a quarter hope, so I was really thankful that she liked it and it went off with lots of love to their home. 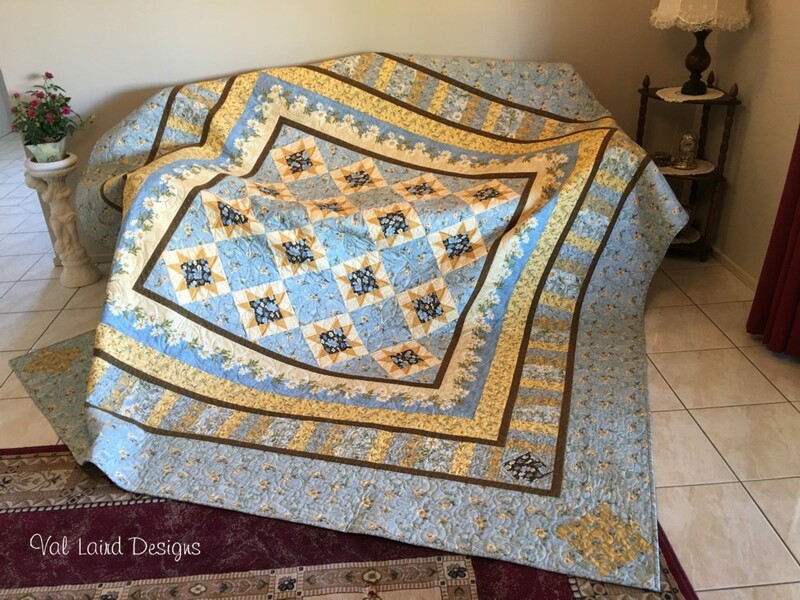 Daughter tells me that every time they walk into the bedroom, seeing the quilt conjures up happy, sunshiny feelings! What more could a mother ask for? A gorgeous outcome from such a dilemma. This looks so great, love the colors. Thanks so much for making it Mum! It's beautiful! I think I it suits my place better than yours so it's a good thing hubby and I both like it! Sometimes a quilt needs to marinate for a long while and then it blooms into beautifulness. Congrats! Wow! what a beautiful quilt and to think it even made its debut in the magazine!! I like the first design too, but the final version is absolutely beautiful! "Oh My Val" You have out done yourself !! Your daughters quilt is fabulous!!!! 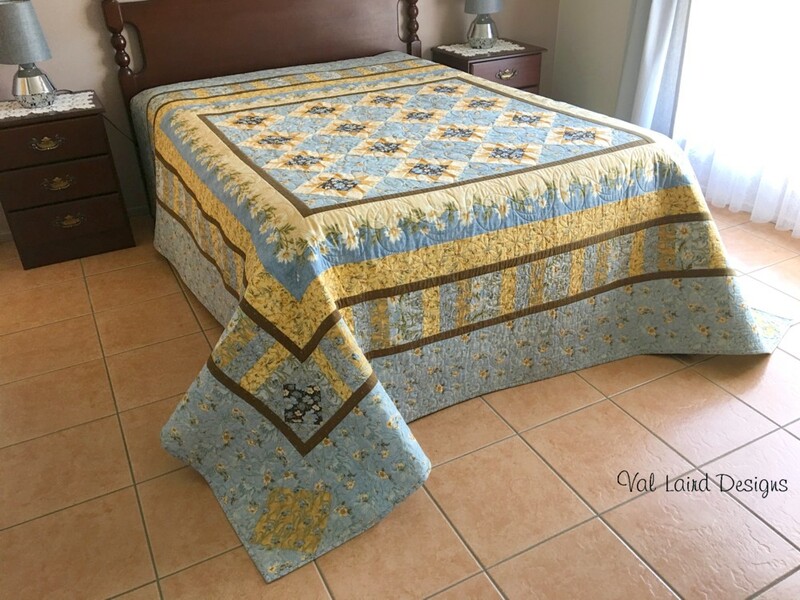 Val, that is just a lovely story of a quilt. I, too, really like the second one, and can't imagine how anyone wouldn't. What a treasure! I'm glad the magazine wanted it, and others will be made here and there.